You’re on fire. Having a local marketing platform manage your listings is the best way to ensure you have a solid baseline for your local strategy. Not all listings management tools or platforms are created equally though. How they perform for your brand can vary wildly, as can the ROI they are giving you. 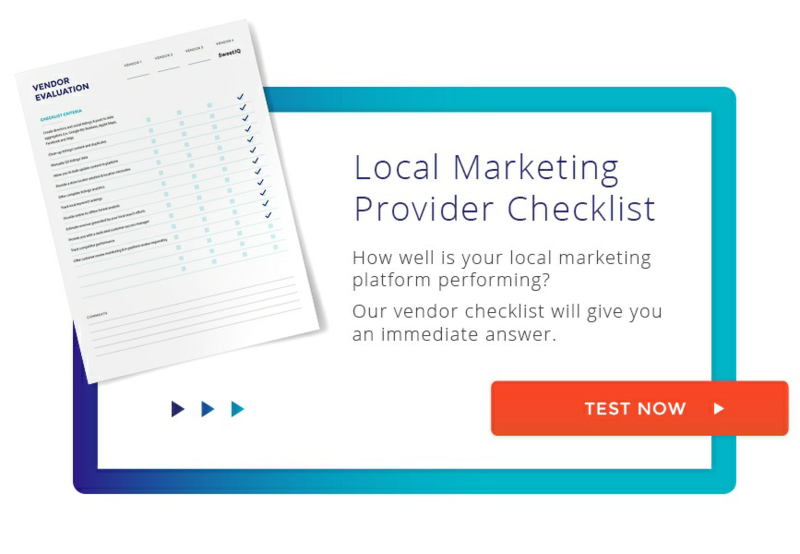 A good way to validate your local performance is to have your locations checked by a reputable local marketing provider. Having a 3rd party evaluate your current setup can point out any gaps in your listings coverage or accuracy issues you need to address. It’s also good just to compare the range of services that are out there. Here’s how to start: Ask for a free checkup (if anyone charges you for this, run!) of your listings. Focus on the key directories like Google, Facebook, Bing, Foursquare, Yelp and AppleMaps to start. Check those numbers against what your platform is showing and if there’s a disparity, start asking why. Did they find any optimization opportunities you were missing? Did they identify duplicate listings that haven’t been suppressed? If you don’t like what you see, maybe you need to start vetting other local marketing platforms. Directories: You’re looking for a local marketing platform that values what’s valuable to you and your locations, not just what they can get their hands on. Ask your current provider and any new companies you look into how and why they choose their directories – they should be selecting based on factors like Google PageRank, Moz Score and Alexa rank. The number of directories you actually need and benefit from can be a minefield as well. The big 5-7 sites are the bare minimum – if you aren’t on Google, Bing, Facebook, and other core directories you are missing the boat. It’s not bad to just focus on the top 5, but if you want to expand to between 10 and about 40 total directories there’s some added value, both in terms of your overall ranking potential and your conversions. Watch out for anyone trying to sell you more directories than that though. Your ROI starts to plateau after about 40 directories. 50 is pushing it and 80 or more and you are wasting money and time on directories that don’t offer you any return. If anyone tries to tell you they will get you on 200+ directories, run! They aren’t in it for you at that point. Duplicates: Duplicate listings can really hurt your local rankings. Not all platforms handle duplicates the same way. You want a platform that can help you identify and deal with duplicates. Depending on the directory and its rules, eliminating duplicates should be done if possible so they are removed from search engine consideration, boosting your ranking potential in the process. Some companies actually create new duplicates every time they create a listing. This is a nightmare scenario. The worst of the bunch even have the gall to charge you to erase the duplicates they just created. Don’t get suckered into winding up with more duplicates than you started with. Aggregators: Data aggregators will be a big part of your consideration around listings. Beware of any agency, local tool provider or local platform that uses aggregators only. They’re offering you a lesser solution that will give you very little in terms of results. Look at it this way: any company that only goes through aggregators to get your listings published isn’t really doing any work for your listings. You’re also going to waste a lot of time while they try to publish to a lot of directories that have no value to you, and end up paying for directories you never appear on as well. All in all a bad arrangement. Instead, you should be looking for platforms that offer a mix of direct relationships with directories – particularly the most important ones – and aggregators. This will give you the best bang for your buck, depending on your needs. Data: How a platform handles data is one of the most critical elements in determining how well they will perform for your brand. The important questions to ask are if they do their own crawling and how they validate their data. Firms that do their own crawling have cleaner, more accurate, and more complete data. If your platform relies only on aggregators for their “data” you aren’t really getting data at all. That type of information is out-of-date, generic and not really of value to your brand. You deserve better than that. The whole package: Finally, compare the whole range of services your current provider is offering to the competitors you are checking out. You should obviously be looking for a lot more than just listings management – if that’s all someone is offering you, take a hard look at some more robust platforms. The range of services you should be looking for really depends on what you need, and what results you are looking to generate. A good barometer for whether or not a platform is legitimate is to see if they have review monitoring, keyword tracking and real analytics. They should be able to track conversions as well so you can measure your performance. Finally, depending on your needs, you can ask about what else they have in their toolkit – things like Local ad buying, store locator tools, review responding and geofilters all help drive local ROI.